Cetinjska street is well known, first of all, after BIP Brewery. One of the first breweries in Serbia, owned by industrialist Đorđe Vajfert started to work in January 1963. The malting section became operational in 1965., and was the only brewery in Serbia which produced malt. Represented a big deal for Serbian, and Belgrade industry as well. Those were a golden ages for Cetinjska 15 street, which was a industrial center of that time. The brewery unfortunately declared bankruptcy in September 2015. 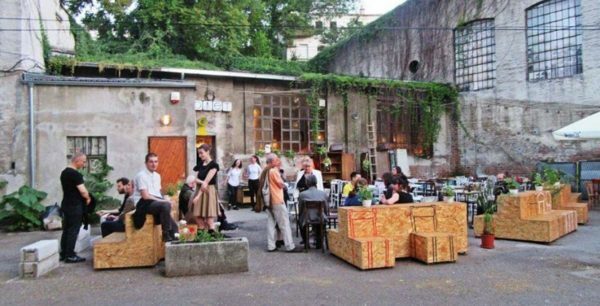 After bankruptcy, Belgrade artists and hipsters took over a place and made an epic change. 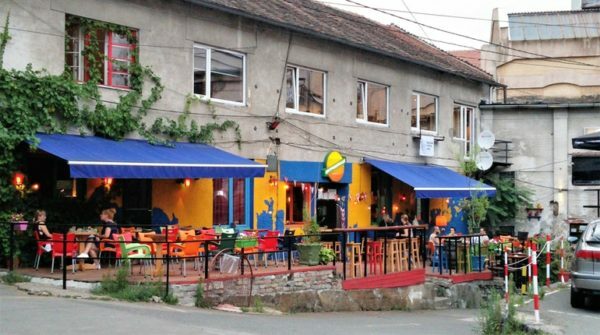 Just opposite to Skadarlija, known after traditional music and good restaurants, Cetinjska was attracting those who prefer alternative entertainment. There you can find smaller cafes, galleries, great pre party venues, and big storage spaces transformed into event places . Tourist named it, “Small Berlin”. In 2015, Cetinjska 15 becomes a leading alternative area in Belgrade. Everything began when famous Venue “ Dvoristance “ moved from the Savamala to Cetinjska. Shortly after, there were more than 15 bars and cafes opened over there. Dvoristance is one of the most popular places among the locals and tourist as well. Beside the retro live music every night, this place is also popular for its sport events – live streaming. This place is a perfect place for the lovers of a good beer, cool people and quality music. You can grab a delicious glass of a local wine and an authentic fast food. For early birds, Dvoristance offers the one of the most incredible breakfast menu in town. Polet is a meeting point for a artistists, creative souls and as well for a highly educated crowd. Polet is also called “vanguard club” or “artistic district”. Polet is a Multi functional space, famous for it excellent coffee. Very Often Owners organize art exhibitions and great swing/electro parties, which are held on weekends. In addition to the standard selection of drinks, they offer a large range of quality teas, which are always served in a teapot of half a liter, and the prices are more than reasonable. 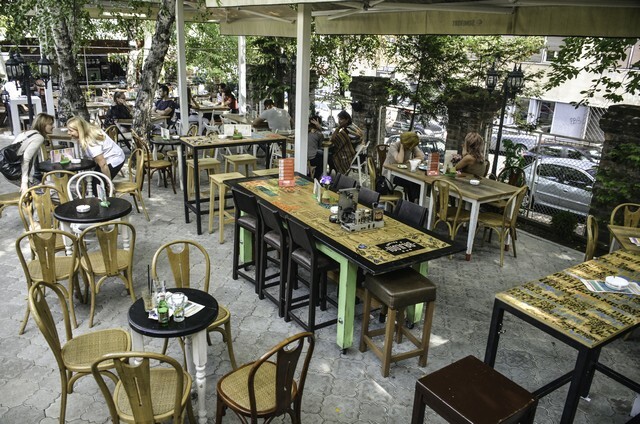 This is definitely one of the most popular bars in Belgrade. Zaokret is a popular place for hipsters and all indie music lovers, with a selection of high quality beverages. This place has found Inspiration from the hipster neighborhood of Kreuzberg, Berlin. During the day, you can listen to indie and other alternative music genres, while the evening is reserved for the performances of DJs. Restored cabinets, racks, frames, old radio receivers, plates, cups and ornaments give this jazz bistro a special flavor, preserving the spirit of old times and interweaving it with the modern designs. On Fridays, Saturdays and Sundays the jazz lovers can enjoy the LIVE music spectacle! Bajloni Jazz Bistro is full of surprises, so you can hear the disco-jazz combos, as well as the gypsy-jazz or pop-jazz with percussion. Staff will be always more than happy to offer you an exclusive wine of the house, while those who prefer beers, will find a premium selection. During the summer time, they have a pretty big garden with a space for up to 200 people. This venue is one of a kind. Program of Kenozoik is composed of musical events (DJ sets and concert program), exhibitions, cinema screenings, culinary happenings, but first of all – friendly gatherings. It is well known after heavy parties; therefore the entry is prohibited for those under 23. Most talented musicians and bands from all over Serbia are playing music in the Elektropionir. This Venue have a proper concert stage, a spacious dance floor and a long counter. This is one of the most popular venues in this area, and almost always is crowded. During a day or a night, this is a place u should visit while you are in Belgrade. The greatest asset of all these venues is that they are located in the same yard. You can just walk from one to another, in the most cases without entrance fee. 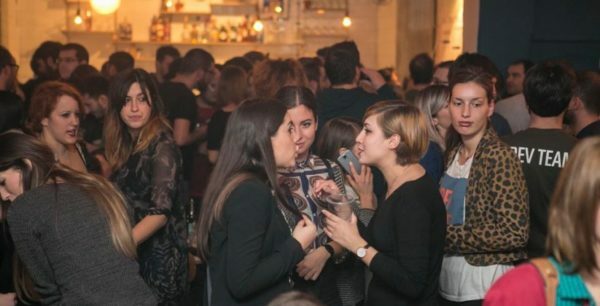 Due to a city official’s law for the noise level in urban areas, there is a constant conflict between owners of those venues and residents who live close by of Cetinjska 15. New Regulations are that all the venues can be open till 1 am. Cetinjska 15, become a perfect place for an alternative scene pre party. After having a good time in this area we suggest you to check some of the best clubs in Belgrade.